The Smart Remote 4 controls up to 8 unit id numbers of Ultimatte-12 via Ethernet or up to 8 unit id numbers of Ultimatte-11/Ultimatte-500 via RS485. 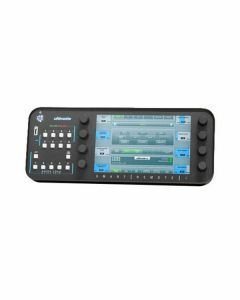 Its larger display area and adjustable stand, along with brightness controls for both display and button illuminations, makes the operation user-friendly. With "Monitor Out Views" accessible from every menu, Smart Remote 4 provides the fastest and easiest navigation for every operator.